Is “Bad Luck” really a diagnosis? Earlier this year the mainstream media reported findings from an article published in the prestigious journal Science, which investigated the causes of human cancer. This would have been all well and good except that it resulted in the appearance of sensational news headlines across many top outlets, featuring the shocking conclusion that approximately two-thirds of cancer in adults is due to sheer bad luck. Yes, you read that correctly, bad luck is apparently the main cause of cancer! The title of the original research paper doesn’t actually mention “bad luck”, and the Science article is really about demonstrating a correlation between tissues that undergo high numbers of stem cell divisions with those tissues that have a high incidence of developing cancer. 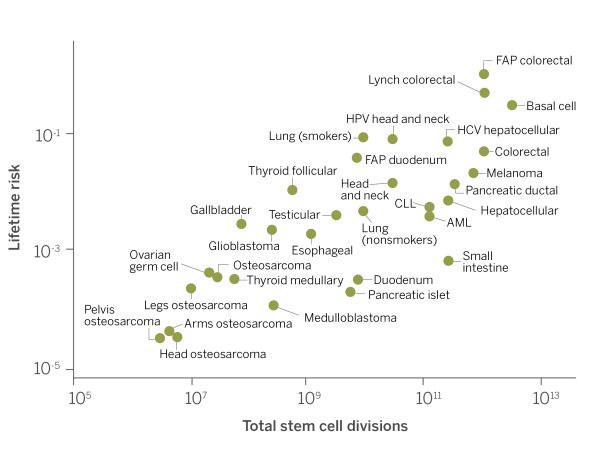 There is a strong 1:1 correlation, showing that as the number of cell divisions increase in a given tissue type, the development of de novo malignancy also increases, and tissues that undergo low levels of stem cell divisions have a low chance of developing tumors. That seems to make sense, and is not terribly surprising given that clinical medicine has known for decades that tissues with rapid cell turnover are tissues where cancer is more likely to crop up, such as bone marrow and intestinal epithelium, just to give a couple examples. The title of the original research article, “Cancer etiology. Variation in cancer risk among tissues can be explained by the number of stem cell divisions”, was published in the Jan. 2nd, 2015 edition of Science. In the popular media the lead author, cancer researcher Bert Vogelstein at Johns Hopkins University School of Medicine was quoted as saying, “all cancers are caused by a combination of bad luck, the environment, and heredity, and we’ve created a model that may help quantify how much of these three factors contribute to cancer development”. A nice sound bite, to be sure, but attention immediately focused on the bad luck part of the explanation, as most people already assume that environment and heredity have something to do with it. This became the essence of the mainstream new headlines. For example, CNN reported that, “bad luck can cause cancer”, and Fox News reported that, “Study concludes that many cancers are caused by bad luck in cell divisions”. So what does bad luck have to do with all of this? Are cancer researchers a superstitious lot? Does invoking bad luck have any real explanatory or predictive power, and does doing so benefit the patient or clinician in any way? My initial reaction to these headlines was that by describing a phenomenon as lucky or unlucky one seems to be crediting some kind of conspiring supernatural force out in the universe, intent on doing harm to the unlucky, and protecting the favored lucky ones. It’s probably more likely -I hope- that the author of the study chose to use this sort of language for it’s shock value to gain the media attention. The language used is almost certainly why the media picked up on this story bringing it to front page status. If the authors had stuck with wording such as “cancer risk is related to stem cell divisions”, then it is unlikely that it would have drawn nearly the amount of media attention as was obtained by the more provocative “bad luck” statement. The philosophy of luck can be reasoned about in several ways, and it’s this ambiguity that has the potential to create some problems and unnecessary confusion. Wikipedia defines luck in one of two major categories, as prescriptive or descriptive. It is this prescriptive definition that I worry many people will incorrectly assume to be the meaning, when sickness or disease is attributed to bad luck. In the Wikipedia article, the prescriptive sense is defined as “ a deterministic concept that there are forces (e.g. gods or spirits) that prescribe that certain events occur”. The same article defines the descriptive sense of luck as when, “people speak of luck after events that they find to be fortunate or unfortunate, and maybe improbable”. What Vogelstein is referring to as bad luck is actually the unpredictable random gene mutations that occur more frequently in the tissue where stem cells divide more rapidly. This appears synonymous with bad luck because it seems to defy a satisfying explanation, but it’s not bad luck in the magical prescriptive sense. The universe is not conspiring against the person who get cancer anymore than it is protecting the person living a long cancer free life. The prescriptive definition of luck also hints at the idea that your luck can’t be changed until something happens to change it. You have bad luck, after all, so why should you expect the future to hold any different sort of fortune. If you got cancer because of bad luck, well then you’re probably not going to be very lucky in the treatment for your cancer, or the way you handle chemotherapy, or if your wife is going to support you through this challenging time, and so on. Well, let’s look at what the original article is really telling us. Why are more frequently dividing stem cells more likely to turn into cancer cells? When a cell divides through the process of mitosis, the complete set of nuclear DNA is copied so that each new daughter cell can begin it’s life with the same DNA as the parent cell. The cellular machinery to copy DNA is sophisticated and there are both proofreading and repair methods to ensure high fidelity of the DNA copy. However, if a mistake is made in the copy process that escapes the proofreading and repair mechanisms then it remains as a new mutation. Keep in mind that at this point, we are not even talking about the mutations that can arise from radiation or cancer causing mutagens, such as stray cosmic rays from space, an X-ray from that chest X-ray taken at the hospital, or even the carcinogenic chemicals inhaled from second-hand smoke. We’re simply talking about mistakes made during the normal process of cell division. In this case you couldn’t have ducked behind a steel beam as the cosmic ray zipped through the atmosphere from deep space or held your breath as you passed those smokers on the sidewalk. These mutations are going to happen because you’re a working machine that acquires wear and tear as you go about the business of living. Despite billions of years of evolution to minimize such mistakes, they have to happen at a certain rate because the proofreading and repair processes simply aren’t perfect, and cells have to divide a lot to get you from a fertilized egg to a full grown human being. Some cells continue to divide even after maturity to maintain the cell line. This is true for red blood cells derived from the bone marrow, for example, since the circulating RBC has only a limited life span in the bloodstream of around 120 days and needs to be replaced by stem cells in the bone marrow to prevent anemia. Even though the error rate in DNA copying is incredibly low, only about 1 in 1011 (that is one in a 100 billion), when you consider that there are about 3 billion (109) base pairs in the genome of each and every human cell, and that there are trillions of cells in the human body, the number of base pairs being copied is rather astronomical! It’s actually amazing that the process is as efficient as it is. There are several factors that make it impossible for perfect fidelity to ever be achievable in the replication of DNA. One such factor is a chemical reaction known to affect the nucleotide bases in DNA known as tautomerization. The nucleotide bases are what accounts for the genetic information encoded in the DNA molecule. The DNA also contains a sugar called deoxyribose, and a phosphate backbone. The four DNA bases are adenine, thymidine, cytosine, and guanine, usually referred to as A, T, C, and G respectively. These bases contain complex functional groups (in the language of organic chemistry) such as keto-groups and conjugated dienes. There is a rapid interchange in chemical structure that naturally takes place so that the keto-group transforms into an enol and back again. These two forms of the molecule interchange so quickly that they are really considered the same molecule, and are a special type of isomer. The keto-form, is the “right” form for base pairing to the proper nucleotide on the other DNA strand, and if it happened to have flipped to the enol form during he critical period of base pairing, then it will have paired with the wrong base. Most of the time the base will be in the keto-form, but in about 1 in 105 bases the other tautomer will be found. This lead to mutation due to the incorrect base being copied from the DNA strand opposite the enol-form of the base. The cell’s proofreading machinery will not be able to tell that a mistake was made in this case. And so, some low level of gene mutation is inevitable. For this type of mutation forming process, everyone has essentially the same risk. Cells that replicate more often would be expected to accumulate these types of replication errors more often. Even without processes like tautomerization, the replication machinery will simply put the wrong base in the wrong place at some low level rate, and occasionally this will escape detection by the proof reading part of the process. Mistakes just happens! Poor DNA polymerase is held up to an unrealistically high standard. Besides replications errors, other cancer causing mutations may vary depending on your exposure to high risk situations, but still occur to some degree even under low risk, normal conditions. Examples are exposure to radiation, carcinogens, or inherited genes that raise the risk of cellular malfunction. There is a constant low level background exposure to radiation from uranium, and other radioactive elements, in the rocks and ground, or from cosmic radiation from space. Carcinogens are all around us, and include exposure to tobacco smoke, but also many other naturally occurring carcinogens such as aflatoxin B produced by fungus growing in peanut butter and nuts and even certain viral infections such as Hepatitis B and Human Papilloma virus. Well known types of inherited gene mutations that increase cancer risk considerably include BRCA1 and BRCA2 in relation to breast and ovarian cancer, but there are most likely many other more subtle gene variants that alter your odds of other cancers, as well. This is the environment and heredity part of the equation. It should also be kept in mind that mutations that do arise supply the variation necessary for evolution by natural selection. Now, most mutations will be silent, meaning they don’t produce any noticeable effects at all. This is due to the fact that most of the DNA in our cells are not part of genes, and do not code for any particular proteins. Only about 2% of DNA is codes for protein. Another small percentage of the non-coding regions (it’s unclear and how much and different sources report different amounts) of DNA have the job of regulating which genes are expressed and when to express them, and a small bit more code for RNA that serve in protein synthesis. Most of the DNA has no known function and appears to be remnants of ancient viral infections and gene duplication events. The term junk DNA has been used to describe this wasteland of the genome, and while the term is not without controversy, since there is almost certainly more functional parts of the genome in there yet to be found, it is probably true that the majority of it is dead weight, being replicated from generation to generation without any true utility. Mutations here will not cause disease, but are very useful for making phylogenetic trees to identify which organisms are more closely related to each others by comparing the similarities and differences that accumulate over time showing common decent. Some mutations, however, may chance to happen in an actual protein coding gene, but in such a way that the protein expressed is unchanged due to the redundant nature of the genetic code. More than one of the triple DNA base codons (the code that DNA uses to specify an amino acid) can code for the same amino acid. Other mutations, however, will alter the gene in some important way, such as placing the wrong amino acid in the protein altering the protein’s function is some critical way. Sickle Cell anemia is a classic example of this where a mutation has turned the codon GAG into an alternate codon GTG, so instead of glutamic acid being placed in the hemoglobin protein, horrible valine is placed there instead. This alters the chemistry of hemoglobin considerably. Even worse, a mutation might turn a codon for a particular amino acid into a stop codon instead, which tells the cell to end production of the protein, resulting in a shortened protein missing vital parts needed to function. If such mutations happen in a gene necessary for regulation of the cell cycle then a cancer cell might just have been born. As a pediatric nephrologist I care for children that often have very serious kidney disease, that may sometimes lead to kidney failure making chronic dialysis or kidney transplant necessary in order to survive. As you might imagine, this can be a devastating blow to a family. It is quite common and natural for the parents of my patients to ask why their child got their particular disease. Although we’re continually learning more about the genetic and molecular basis for diseases like cancer or kidney disease, the fact is most of the time we have no good explanation for why one particular individual out of thousands got the disease. It is usually not very satisfying for either the parent or the physician to simply say, “I don’t know”, although that is often the honest answer. I recall one of my professors while I was in my nephrology fellowship training at Yale, who responded to a parent asking why their child had a very serious type of kidney disease, known as Focal Segmental Glomerulosclerosis (FSGS), that has a high likelihood of leading to kidney failure despite any available treatment options. My professor’s response was, “Damn bad luck”. While that particular family seems to accept that assessment, I’ve witnessed other physicians use that same line with less pleasant results, even to the point of a parent becoming extremely offended by talk of bad luck. It was almost like the diagnosis of bad luck was the same as being told that someone had placed a Voodoo spell on them. Personally, I most often simply state that we just don’t really understand why some people get a particular disorder and most people don’t, and move on from there to what we do know about the condition. I’ve found this to usually be effective in moving the conversation forward. I’ve also seen many patients that do seem to have one unfortunate event after another happen in their lives. For example, a patient with a congenital birth defect of the heart may have to go through many heart surgeries and life threatening events only to later down the road develop a cancer, and the treatment of the cancer may inadvertently lead to kidney failure, and so on. It seems natural to think of bad luck when you consider their situation. The “law of large numbers” would be a more logical explanation, even if it is not always a satisfying one to the family. This concept reminds us that if you have a large enough sample size (our sample is the entire human population) then essentially anything that is possible will eventually happen, no matter how unlikely it appears to be. Even if that particular sequence of events has only a one in a million chance, if your sample size is a million, it should happen at least once. My guess is that for the example given above the chance is actually a lot more likely than a million to one. The results of random chance can appear like bad luck due to the way our human minds process information. Human minds evolved to detect other minds that contain thoughts and intentions like our own, evolved to react in an emotional manner to events so that decision making would be quick and helpful in many commonly occurring situations, and evolved to find patterns even in random background noise. Unfortunately, this leads to many false positive results, so that the human mind may therefore perceive an intelligent agent where none exists, give an emotional response unfair weight over a rational interpretation of events, and find significant patterns in random noise. So, is bad luck really a diagnosis? It is! But only if it is clear that this is being used as short hand for random, unpredictable events, and not evil forces with intent on harm. Many people are superstitious and naturally assume that there are universal powers out there, with an interest in us, benign or otherwise, and playing with our fates. The prescriptive sense of the term implies some sort of universal apathy in the case of bad luck, or empathy in the case of good luck. There is no objective evidence that this is the case. Our minds didn’t evolve to see statistical patterns. It takes work to find statistical patterns (usually by conducting well designed scientific studies – something our distant ancestors didn’t do), and even then a statistical explanation may not feel satisfying or even to agree with “common sense”. Our brains try to find patterns where none might exist. If an unusual event happens to us or a loved one, we have the need to try to explain that unlikely occurrence through some narrative, not realizing that many rare events are happening all the time. 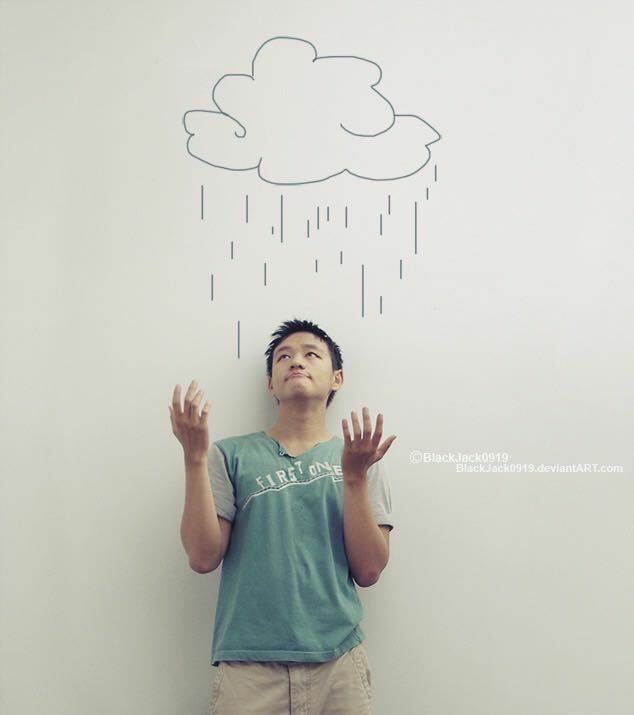 Bad luck, the kind of bad luck that has any real meaning, is the product of random chance. Just a statistical roll of the dice, and that’s what this paper in Science is really showing. The universe is not trying to help us succeed, but neither is it trying to wipe us out. It is absolutely indifferent to us being here. Even our DNA polymerase that replicates and proofreads our DNA is not trying to help us. DNA polymerase has simply evolved to be only as effective as necessary to propagate the genes for making more DNA polymerase. It has no reason to be more efficient than that, but can’t be less efficient either or else it won’t survive into the coming generations. We are the ones that care what happens to each other. We have the brain power to decipher the world and have an interest in what happens to ourselves and our fellow humans. By taking luck out of the equation we can search for the real explanations for how things work and the events that transpire in our lives. Science is the tool to do so and has so far been an invaluable tool for finding true patterns in events that once seemed random. We still have a lot more to learn, but bad luck should never be the full diagnosis, just the short hand notation for when don’t have enough information to give a satisfactory explanation. Even then it should only be used carefully so not to misguide the patient. It is ok to admit when we don’t know why, but reassure the patient that we will keep looking for the answer, and in the meantime will provide the best care using the available science-based evidence.